Bloomberg announced Compass has raised a $400M investment round that values the company privately at $4.4 Billion. This moves the real estate company’s valuation to more than twice that of the prior round. Compass’s growth is impressive, that is undebatable. What is debatable, however, is the valuation. Is the premium supported by Compass’s growth rate? It’s technology? Can Compass keep it up? According to the REAL Trends Top 500 By Volume, Compass ranks #6, with an estimated $14 Billion in sales volume in 2017. According to Bloomberg, the company estimates sales volume will be an astounding $34 Billion, which would allow them to move up three spots in the rankings. To be fair, franchises such as Keller Williams are not aggregated, so this is not a fair apples-to-apples with the likes of the aforementioned, Re/Max, Berkshire Hathaway Home Services, etc. A better proxy of growth for Compass would be ‘same store sales’ — which excludes the added sales gained by acquisitions (if anyone has these figures, I’d love to know…). With a balance sheet dripping with cash, Compass has been buying up brokerages left and right. The company has publicly stated its goal of achieving twenty percent market share in twenty markets by 2020. Adding to this a (self-purported) best-in-class technology and it presents a compelling story for investors. How justified are these valuation figures for Compass? A Sheep in Wolves Clothes? The most common valuation method for private and pre-profit companies is comparable analysis. Compass’s public market comparables are Realogy and Redfin. Realogy in particular is a conglomerate of impressive brands: Century 21, Coldwell Banker, NRT, and Sotheby’s. The company’s public market cap (i.e. the value of all it’s publicly traded shares) is approximately $2.5 Billion. Look back at the REAL Trends Top 500 by volume list at number one: NRT, a Realogy company. Similarly, Redfin trades at an approximate $1.7 Billion market cap. According to the Bloomberg article, an unidentified Compass representative estimates the company will report revenues of almost $1 Billion this year. Applying the high-end valuation, this supports an approximate $3.36 Billion valuation. That’s a 30% discount to the company valuation. Does Compass warrant this sort of premium? Possibly. Here’s the rub, however: when performing any valuation, it comes down to growth opportunities. Financially speaking, this is generally referred to as the present value of growth opportunities, or more simply put, the value today of all the future growth the company is expected to generate. Obviously, investors are predicting Compass will continue to grow at a high rate, reap benefits of it’s technology, and ascend to the top of the real estate world. It’s common for technology companies to garner most of their current valuation from expected continued high rates of growth (think Google and Facebook versus Union Pacific Railway). This is due to two factors: acquisitions and technology. 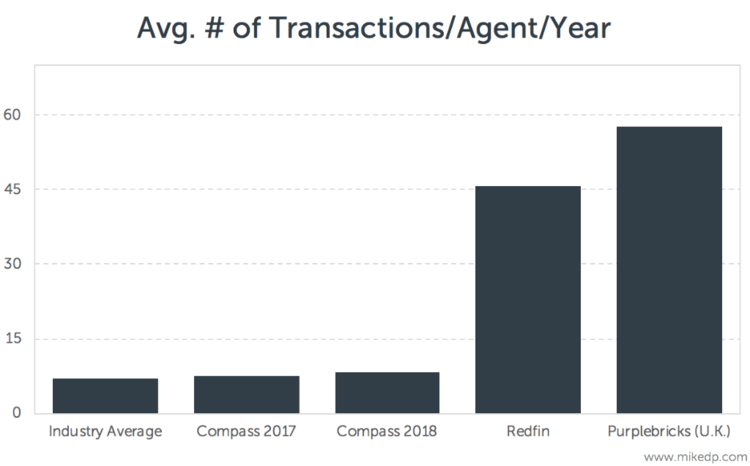 For Compass to continue to grow at this clip, they’re eventually going to have to move out of the luxury market and dip into Redfin’s territory. This means lower prices and lower commission values. It becomes a game of quantity over quality, and often times this can erode valuation premiums, especially if it means moving away from acquiring only top-tier brokerages. The company would commoditize and potentially rid itself of the premium-justifying luxury market niche. A second underlying key to that last statement shouldn’t go unnoticed. Compass actively (and exclusively) recruits already-successful agents. So this limits the potential upside for the company’s services — it is simply a conglomerate under a unified brand. The added (read: premium) advantages then come down to what Compass adds to the value equation: branding and technology. We’ll tackle technology in the following section, but branding should not be ignored. Many of the largest companies in the world carry significant value on their balance sheets in the form of intellectual property: patents (not applicable here) and brands (think Coca-Cola, WalMart, etc). The Compass brand has real value and many of its agents will echo these sentiments, especially as the company continues to be the darling of investors, publications, and tech-savvy agents and consumers. How much branding is important in this space is debatable. Consumers transact infrequently with real estate brokers, so brand loyalty is low, and firms are better off competing on quality of service. Surely Compass is out to change that. Even Gary Keller would agree with Compass on this point. So in sum, branding less important, niche-y premium unlikely to be maintained at scale, and acquisition activity bound to slow eventually. As Real Estate expert Mike DelPrete keenly notes in his piece that questions whether Compass is even a tech company, he estimated the company has a low percentage of staff dedicated to technology — a measly 4% — and has yet to see genuine accretion from technology. The argument is as follows: technology should create efficiencies, and in the real estate industry, this means more transactions per agent. Redfin is a tough comp here as it’s business model differs substantially from Compass’s — it’s quantity over quality, so it’s technology was built to support employees who are responsible for only parts of the transaction. Compass, on the other hand, operates a more traditional model and strives for quality over quantity. This creates an odd juxtaposition within the company: should it focus on technology that creates efficiencies (quantity) or one that deliveries a better customer experience (quality)? Are they mutually exclusive? This is still a service industry, and technology should, and always will, play second fiddle to the agent. Nonetheless, when it comes to efficiencies, Compass is not significantly ahead of the industry average, which is of course dominated by similar business models. What about the technology itself? I do not doubt the company will build great tools, but technology itself is not a solution. Great agents are still needed. Beyond that, there is nothing stopping firms like Keller and Realogy, and more seriously, startups, from developing the same technology — none of it is entirely unique. Furthermore, companies like Keller have a larger sales force and client base to gather more data (how intelligently that’s deployed is a key, separate issue, however). So Compass needs to grow quickly and expansively to acquire the amount of data it needs to build a true competitive advantage. Compass wins by simply having an existing, functioning (mostly) end-to-end platform for it’s agents and clients, because most do not. Let’s keep in mind the bar for technology is set impressively low in the industry. Is it delivering a competitive advantage? So far. But, is it likely to forge a sustainable, competitive moat? The barriers to entry to build a brokerage, raise a billion dollars, and develop a technology platform are substantial so it’s likely to stave off competition from existing parties for quite some time. The key word here is ‘existing’ — startups and new models (hello, iBuyers) can offer better technology and/or license it to Compass’s competitors, gaining access to more data as an asset and leveling the playing field. The bottom line is technology is great, but it is not a solution in and of itself, that requires a strong business model and execution. Recommendation: Buy, Sell, or Hold? There’s no doubt the company deserve a significant premium to others in the field, but given it’s lofty goals and expectations, I’m recommending a hold on Compass. Even agents who are worried that Compass may eat their lunch can take comfort knowing that a common theme among all new entrants and fast growers is the importance of the agent. The future of the real estate industry is a tech-enabled agent. Technology companies that do not realize that are bound to fail because they are those that are simply building bells and whistles that don’t add value to either an agent’s workflow or consumers. What about Compass? Will their growth slow as they recede into the non-luxury market? Will their brand hold up as a competitive advantage? Is their tech world-beating? Will you be working for Compass in two years?